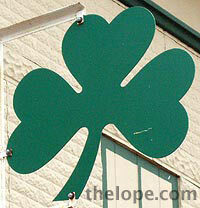 I tend to save back anything remotely Irish in nature for release around Saint Patrick's Day, like this Shamrock Foods sign in Phoenix which I actually shot a few years back and just found a print of. 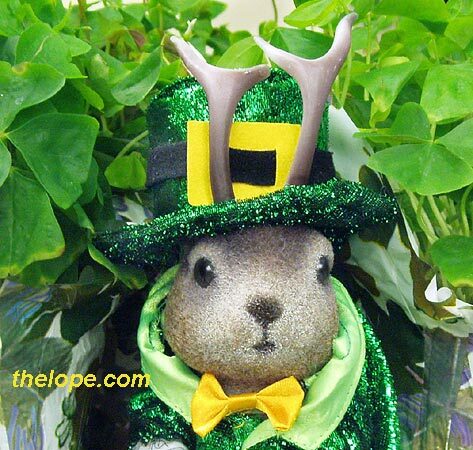 Here is this year's potpourri of shamrocks, churches and other things green. Last May Day I was tracking Union Pacific's steam locomotive 844 across Kansas and ran across the small town of Chapman, population about 1,400. 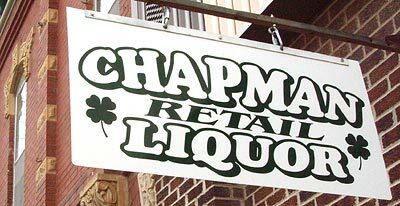 Chapman was settled in 1853, largely by Irish immigrants. I returned to Chapman in March of 2007 and have combined the photos here. 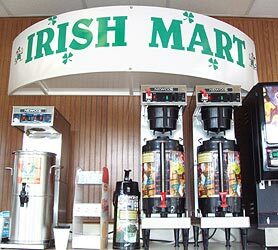 I knew there was something green and different going on when I passed the convenience store. 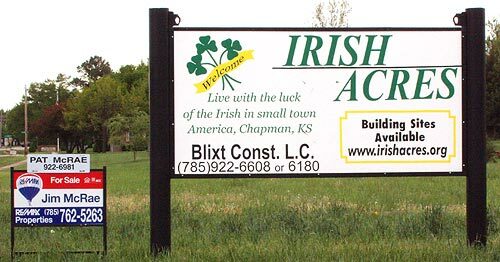 And the Irish Acres sign was a strong clue. 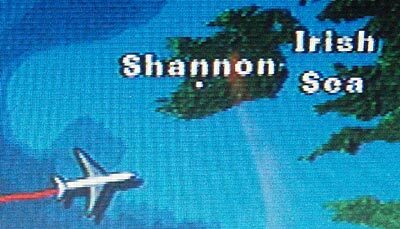 ...to some of the street signs, like Irish Drive. I believe that's a bit of rain dripping off the sign; it was overcast during all of my stay in Chapman. 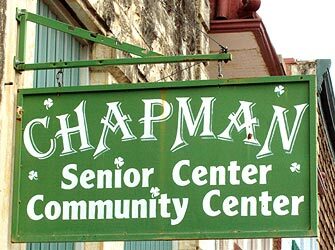 Yep, this would be a theme town, as seen in the signs for Chapman Retail Liquor and the Chapman Senior Center Community Center. 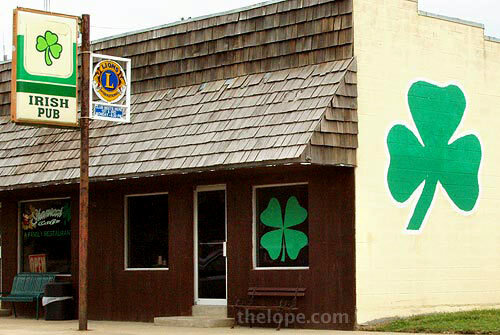 Of course there'd have to be an Irish Pub. 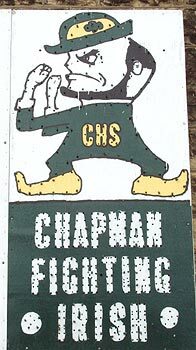 And the local high school team would be the Chapman Fighting Irish. 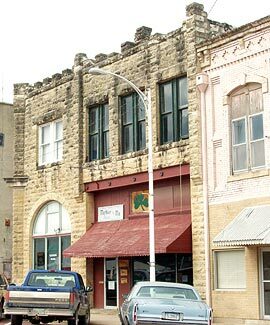 Chapman's small downtown has the typical nice old small Kansas town buildings. I liked this bit of architectural detail. 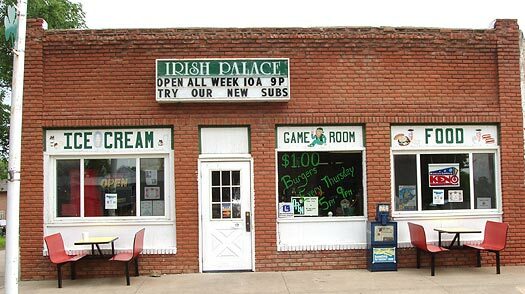 I stopped to have a snack and download my steam engine pictures into my laptop at the Irish Palace restaurant. 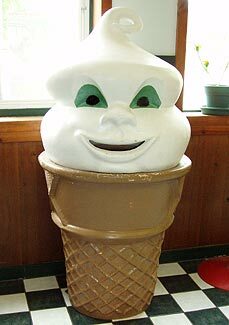 The restaurant had this cool anthropomorphic ice cream guy. His eyes were even green. Chapman's St Michael's Church dates from 1883. 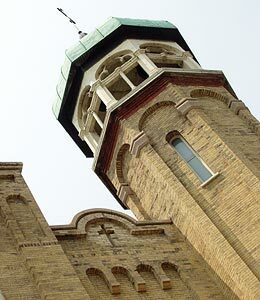 Here is the top of its tower. 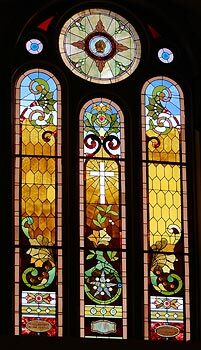 One of St Michael's stained glass windows. 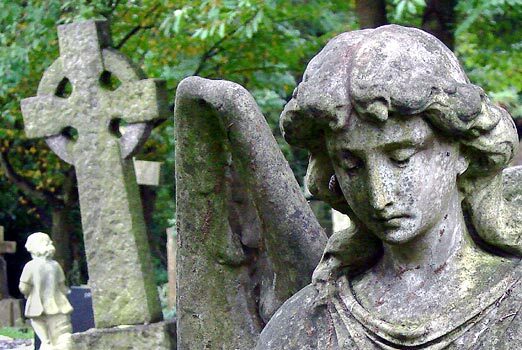 The jewel of the city is St. Patrick's Cemetery, founded in 1859. From what I've read at their Preservation Society's website, the city started in 1853, so that's just six years later. I guess when you start a town you have to think about a cemetery fairly soon. 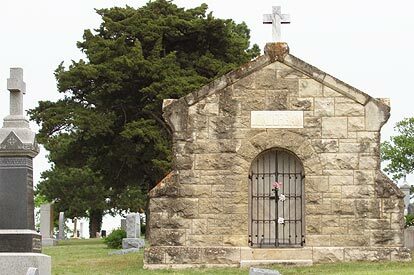 This is the classic small town cemetery on a lonely windswept hill. The overcast day in May of 2006 lent a starkness to this place. 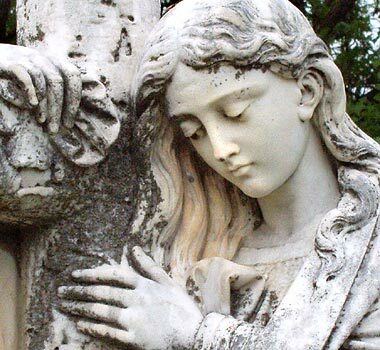 The St. Patrick's Cemetery History link at the Chapman Preservation Society's gives tombstone transcriptions and genealogical notes. You'd think that'd be pretty dry stuff, but there's a lot of human drama contained in those notes - not just the usual hard life of a pioneer stuff either. 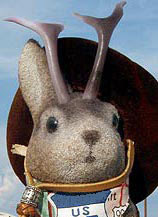 There's murder, suicide, a marshal and the outlaw who killed him - it's all there. 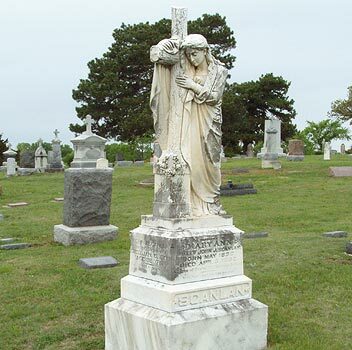 There were two big statues like this one, which marks the graves of the John and Mary Ann Scanlan family, both originally from County Tipperary, Ireland. 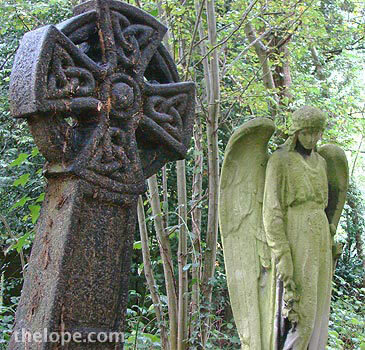 Many of the grave markers mentioned the place of birth of the deceased, and it was often Ireland. 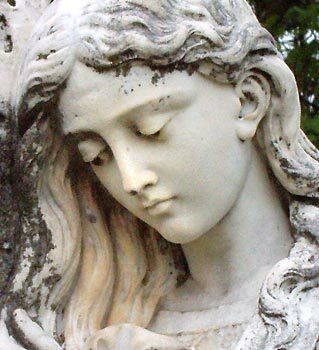 This similar statue is for Mary Ann Boland who died in 1888 at the age of 19. 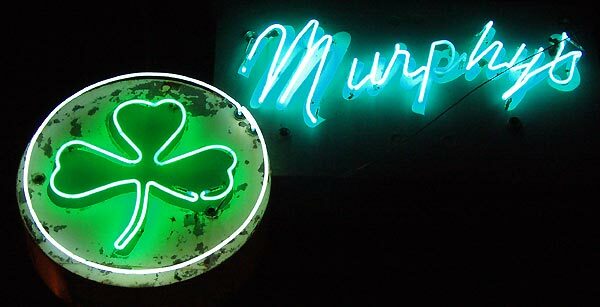 The marker for this priest's grave was nothing noteworthy, but the Michael Moran's epitaph summed up the apparent feeling of many of the inhabitants: "This 3' x 8' corner of St Pat's will be forever Ireland"
About two weeks after being in Chapman, I photographed this wonderful Murphy's bar neon sign on Main Street in Joplin, MO. 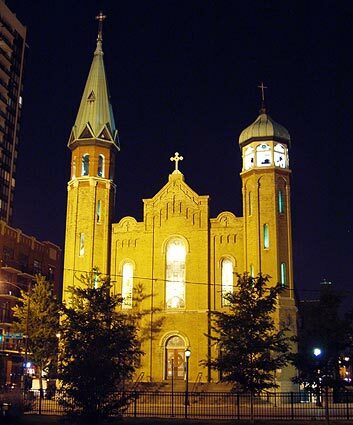 This is one of its towers. 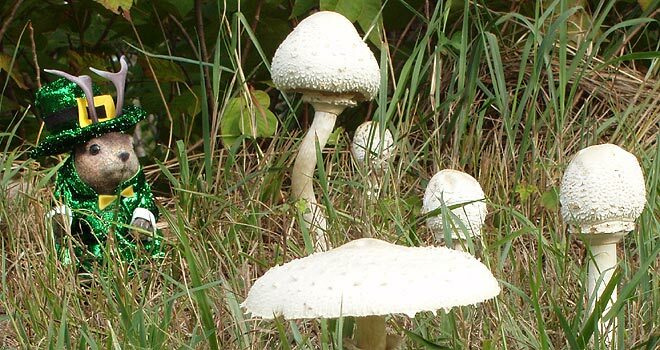 And in August I saw these mushrooms growing along Kansas hwy 61 north of Hutchinson, KS. Can you spot the leprechaun? In October I flew to London and got a real kick out of the GPS screen on the seat backs. 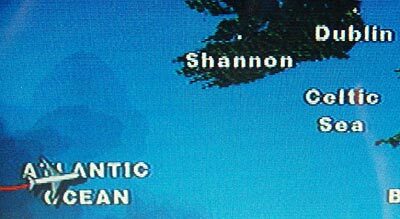 "Celtic Sea"...sometimes a mere name is so evocative. 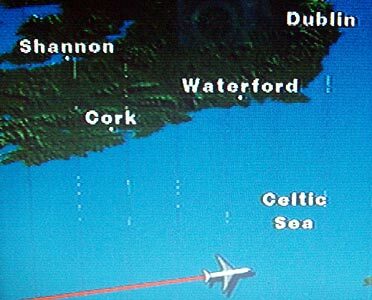 There was total cloud cover, so I could only tell we were passing Ireland by the image on the screen. I always feel a longing when seeing how close I am to a country I've never visited. 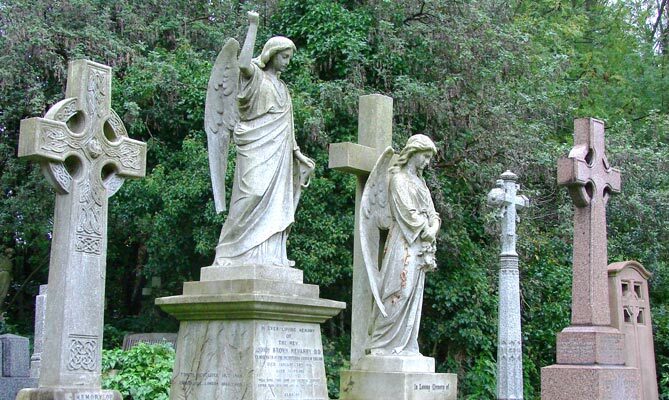 While in London I took the Underground and a couple busses out to see Highgate Cemetery, London's beautifully decrepit Victorian cemetery. 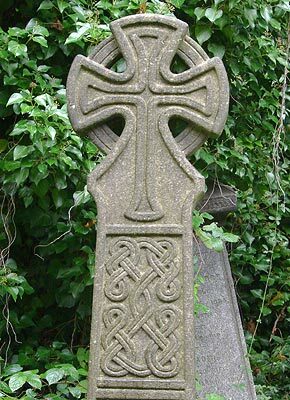 Scattered among the many evocative tombstones were many examples of the Celtic cross. 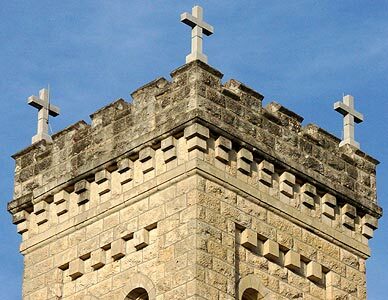 Legend credits Saint Patrick himself with inventing the Celtic cross as a way to help Christianity go down smoother, as it were. He is said to have combined the pagan sun symbol with the cross, thus giving us this classic symbol. 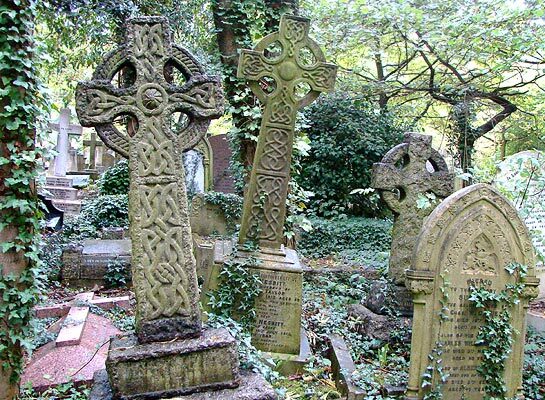 The crosses in Highgate Cemetery are examples of a Victorian fad, but there are much older ones scattered about the UK, especially Ireland. With great difficulty, I finally tore myself away from this place. I shot pictures on the flight home. 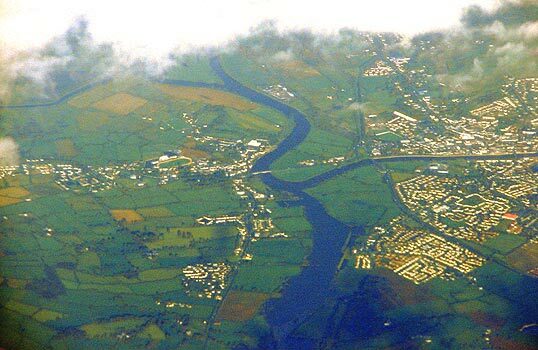 The glare was awful and the clarity of the windows was, as is usual on planes, abysmal. However, I had previously learned that greatly increasing the contrast with Photoshop really helps, even "auto correct" will get you most of the way there, with some dodging, burning in and color correction required for tweaking the image. The drawback is that already light areas like clouds burn out, and color becomes a bit speculative. 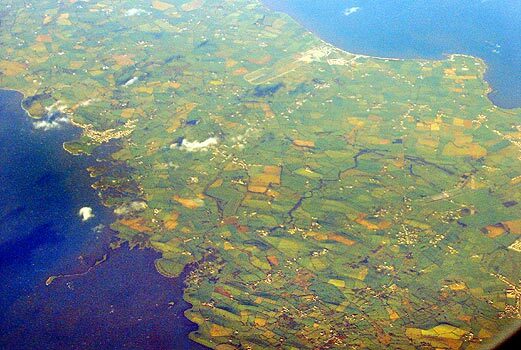 If my flight attendant was correct, this is Ireland. Since last year's post, a reader asked if her tattoo might be of interest in a future St Pat's post. Here's Ace checking out the ink on his friend Fran. 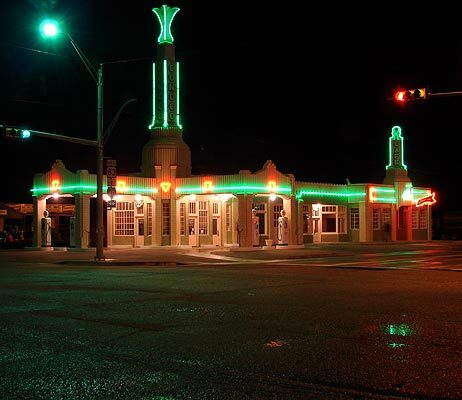 As if the name wouldn't clue you in, you'll know the Route 66 town of Shamrock, Texas plays up its Irish connection. 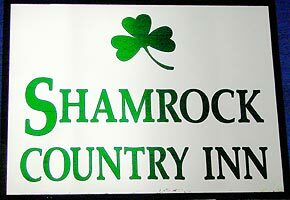 The Shamrock Inn sign is one of several in town with an Irish theme I saw just a few days ago. 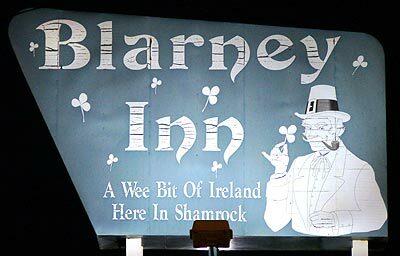 The Blarney Inn sign is faded. 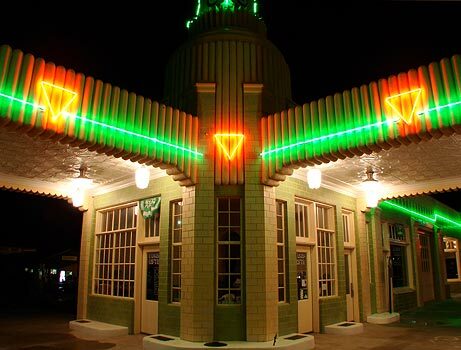 But the jewel of Shamrock is the art deco neon encrusted wonder, the restored 1930s Conoco station. If ever there was a case for a very wide angle lens, it's here. You have to use one to get the corner view without the traffic light. 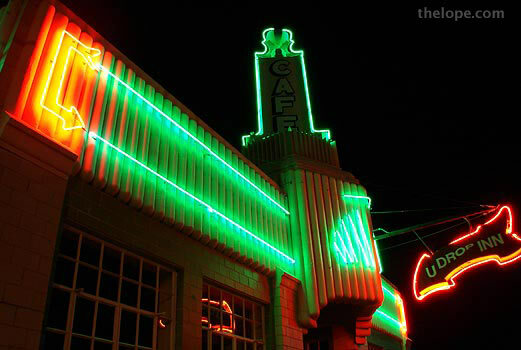 I don't know if the green neon is historically accurate, or if it was chosen because of Ireland, but it sure works. 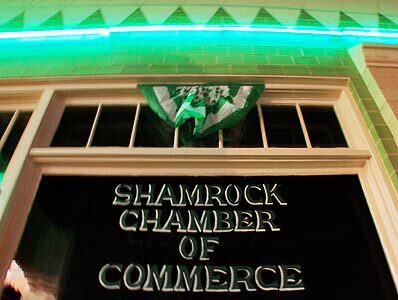 The building currently houses the Shamrock Chamber of Commerce. 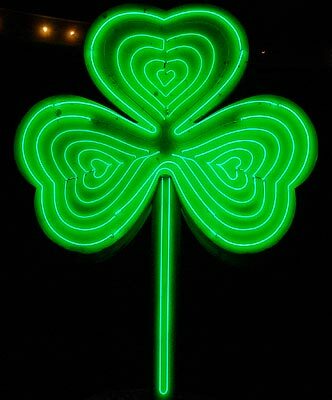 The city holds a huge St Pat's festival, as if you'd need to be told that. It's not e over yet for this year; here's a schedule. 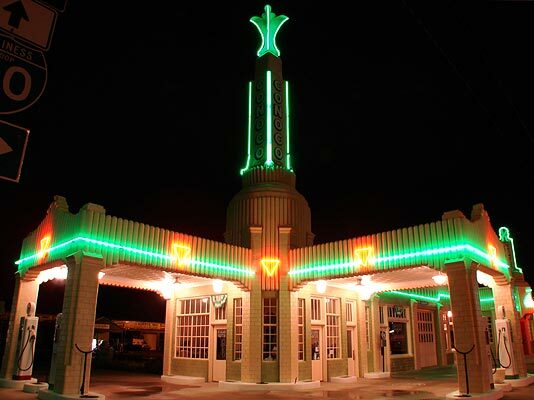 I've had the pleasure of seeing the restoration evolve, as I go through here every couple years or so. 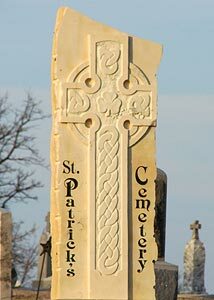 I noted the station in last year's St Pat's post, and included some links to more photos. 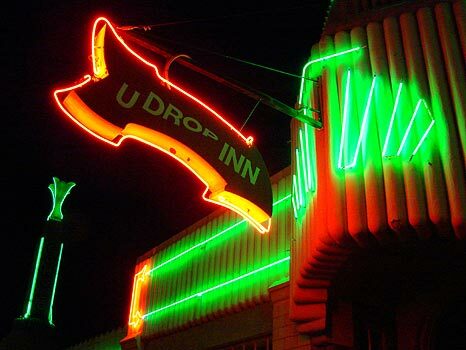 The U Drop Inn, attached to the service station, was a diner back in the heyday of Route 66. The space is currently used for receptions. Ace kisses the blarney stone slab in a Shamrock park. Moving on west on Route 66, Ace encountered this Shamrock gas globe in Dot's Mini-Museum in Vega, TX. 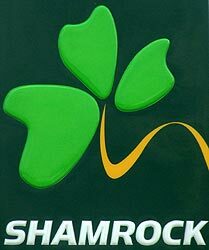 Shamrock has changed to this logo, seen on a working Shamrock convenience store in Vega. 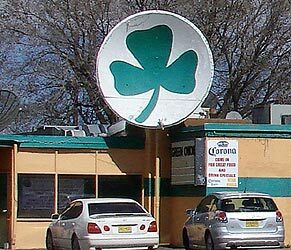 The Green Onion, a bar in Santa Fe, NM, sports a shamrocked satellite dish. Turning south from Rt66, I find myself in Phoenix again, where the first photo in this post was taken. 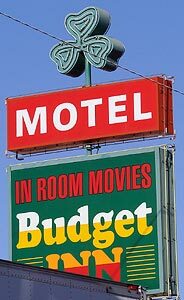 The neon shamrock is the only cool thing about this Budget Inn sign on Hwy 60 in Phoenix. 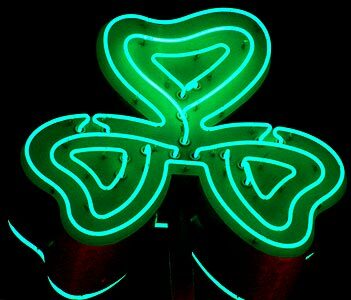 And now, an updated close-up of the neon shamrock in that Shamrock Foods sign. 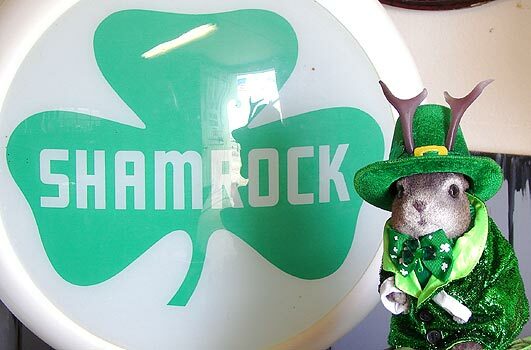 Have a happy and safe St Pat's Day! 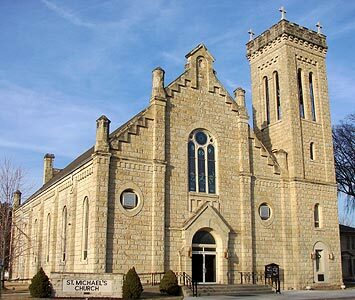 I am from Chapman, Kansas and darn proud. I grew up hating it there and couldn't wait to leave and now I just want to go back.